As many already know, Mister C's Steakhouse is closing it's doors at the end of September. Since they're closing, it doesn't make sense for us to do a full review of the place, but at the same time, they should get recognition for what they have grown to become over their rich history. 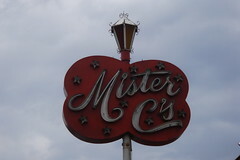 To be honest, I had never been to Mister C's and really had no desire to go until I heard they were closing. It's kind of a shame really because they have a lot to offer. I'll come right out and say their food is not the greatest, but I'm not really sure that even matters. You come here for two things: the atmosphere and the steak. Both of which are Omaha classics. The steak here actually took me a bit by surprise. There are endless debates by the people of Omaha about who has the best steaks in town. It never fails - you have visitors in town and the first thing they want to do is try one of those famous Omaha steaks. You take the time to explain to them that an "Omaha Steaks"TM steak is not the same as an "Omaha" steak and there is no such thing as steak from Omaha. That's right all you Qwest Center visitors, there are no cows in Omaha. Sure Midwest cattle may get shipped here and turned into some of the best corn-fed beef you can find, but it's still not from Omaha. Now that they have that clear, you cite the merits of each of the big steakhouses such as Gorat's, The Drover, Omaha Prime, Johnny's Cafe, Anthony's, Cascio's (perhaps briefly morning the loss of Caniglia's) and of course Mr. C's. And if you're like me, there are very few of these names you mention with much enthusiasm, because you know the best steaks in Omaha are found right in your own back yard. If you're lucky, you may get through to them that your local specialty butcher has access to better quality meat than a restaurant that has to buy in bulk quantities. If not, you're off to one of the restaurants I listed above. As it turns out, that may not be so bad. I learned steak is the one thing Mister C's does really well and the reason their steaks taste so good is because they taste exactly like my steaks. I mean exactly. 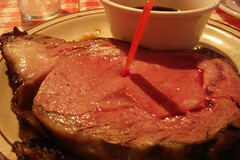 For that reason, I think one could argue that Mister C's has some of the best steaks in Omaha. Now the ambiance, that's something else entirely. It's hard to describe and do it justice. Pictures do a better job, but they still don't fully capture the magic. 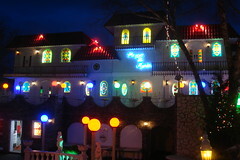 Sure the place is kitsch and corny, but who cares. It's fun, interesting and immediately puts you in a festive mood. There's also a touch of reverence owed to a place with so much history told within it's walls. Looking at the diorama full of famous Omaha figures, you'll know what I mean. And putting aside any preconceived notions, you'll find some of that Italian melodrama has a beauty all it's own, such as the Piazza Di Maria, the colorful garden space behind the restaurant which is frequently used for weddings and banquets. At night the lights and stained glass create a mosaic that has a bit of magic to it. So if you've never been or haven't been since you were a kid, I highly urge you to go before they close. I'm sure you'll be hearing more about the 50+ year history of Mr. C's Steakhouse and the Caniglia family in the coming weeks. Give yourself some memories to add to those stories. Feel free to share your Mister C's stories in the comment section below. If you want to keep a piece of that history, a liquidation auction will be held October 6th & 10th. Closed permanently September 30th, 2007. P.S. - Please don't steal their menus.